Returning Registration will take place on 13 October, Saturday morning, and it looks to be business as usual: an emailed link and reg code, a waiting room, your accelerating heartbeat. 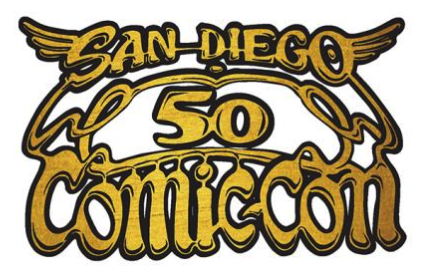 What is new: CCI's #SDCC50 hashtag, which they are very excited about, so please use it often. If you need to refresh your badge sale memory, all the rules are here. 2018 first-timers: this will be your first Returning Registration. It functions just like the Open Reg you got your badge in. The good news is that your odds are slightly better, because you're only competing with 2018 attendees instead of the general public. So don't skip this. Even if you're on the fence about going (yes, there are people like this) or think you might have a summer conflict, try for a badge anyhow. You can always get a refund. The handling fee is $7.50. So should you get it all, you'll be paying just under $300. So we're off to the races. Make sure you've got a viable credit card at hand and are clear on sale arrangements with friends and buying comrades. If someone can't cover anyone financially, or may have to work, get that sorted now.